I recently tried to make a chocolate strawberry bouquet, but I'm having trouble getting the skewered chocolate covered strawberries to stay in place. I bought the skewers to use in the strawberries. When I dipped the strawberries in chocolate the skewer kept coming out and ruining the look of the seamless chocolate. Is there an easier way to attach the strawberries to skewer? 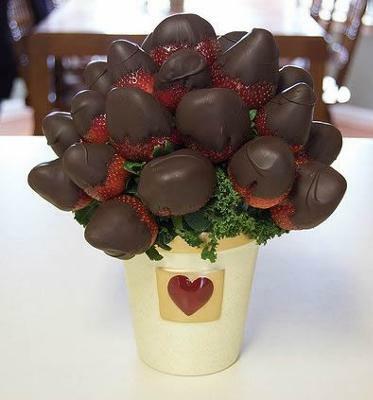 I understand exactly what you're talking about when it comes to dipping strawberries for a chocolate covered strawberry bouquet. The first tip I can give you is to try to get really firm strawberries that are not over ripe. The softer the strawberries are on the inside, the more they are going to want to slip off of the skewers. Secondly, work with the strawberries at room temperature if you can. The extra moisture from having them in the fridge before dipping can lead to more slipping. Third, you might find that working with smaller strawberries is easier. Have you ever noticed that sometimes when you cut a strawberry in half there's hollow section right in the center? This is usually seen on really large strawberries. Of course, if you've put the skewer in and the center is hollow, there's nothing for it to really grab on to. If you find that to be the case, keep pushing the skewer farther in, almost into the tip to get more hold. If you are trying to salvage the strawberries that you've already dipped, maybe you can remove and dry the skewers, then dip the ends of the skewers in melted chocolate and poke them back up into the strawberries. When the chocolate sets, it may be enough to hold them in place. Finally, when you dip the strawberries, place them upright in a piece of foam or something similar so that they are not having the weight pulling on them in the other direction, loosening the strawberries from the skewers. I found this lovely Flickr photo above by somegeekintn as a really cute example of a chocolate strawberry bouquet. I'd love to add YOUR photo when you get your strawberry bouquet finished. Send it/them to me and I'll be happy to add them.